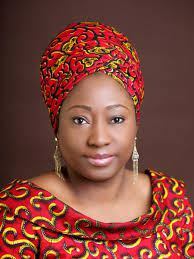 Wife of Ekiti State Governor, Erelu Bisi Fayemi, has said that she was delighted at the UN Women award given the state government, describing it as a remarkable recognition of the state government’s laudable activities in gender mainstreaming. Speaking in Ado-Ekiti at the weekend, Erelu Fayemi said the award which was in recognition of the strong political will in the area of gender mainstreaming, will spur the state government to be more committed to gender issues. She however said that contrary to some media reports, the award was for the state government and not to her, adding that it was only presented to her in her office. According to Erelu Fayemi “I am delighted that the Ekiti State Government has been acknowledged by UN Women and the OSSAP SDGs for strong political will in the area of Gender Mainstreaming and Women's Empowerment. “The Ekiti SDGs office received the award in Abuja recently on behalf of the State Government and came to present it to me at a courtesy visit. I acknowledge all the kind words of congratulations but I would like to point out that the award went to Ekiti State and not to me as an individual. The Wife of Governor also stated that efforts are being put in place for the return of the Ekiti Development Foundation (EDF) to continue its development work in the state.